A thunderstorm lashed the sky, dense, grey sheets of rain pummelled the ground, the television went blank, the house morphed into dark, gloomy and small, the wind swept through gaping windows and quivering doors and a fine spray of rain caressed an arm with chilled drops......... a cold quiver settled inside of me and I could think of little else but Wuthering Heights and Jane Eyre, Heathcliff's unresolved passions and Mr. Rochester's brooding misery.... what did I do? I made bread. 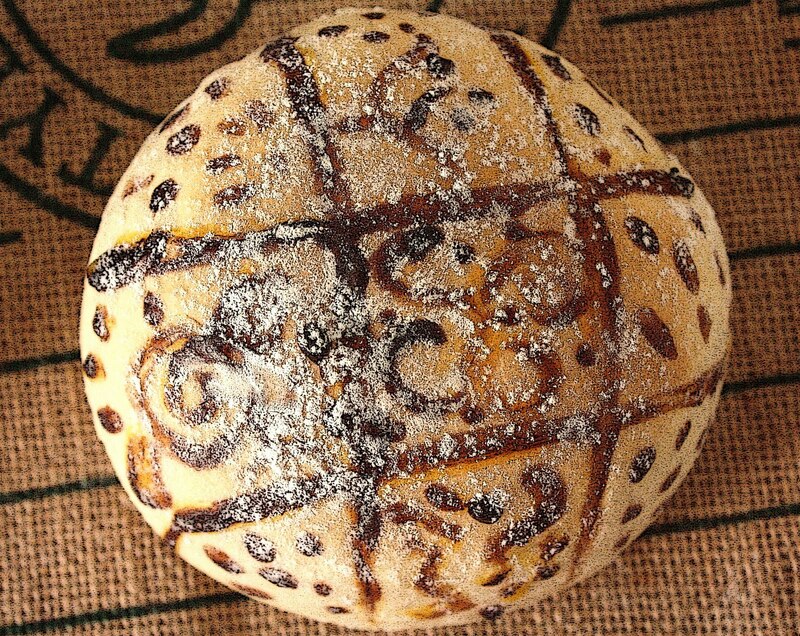 I should have made "lunatic mugs with smiling faces" ...but I made bread. Had it been a little colder I would have lit the fireplace, if I had one, or a wood oven if I had one too. Black thunderstorms are a haunting pleasure. I love them. When I'm happy. 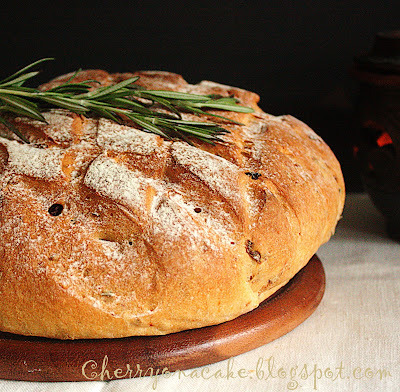 I was.... so I made a rosemary infused bread embedded with flecks of sundried tomatoes baked to a crust on the outside, tender on the inside and entrenched with flavour all over. And I caught them all in the amber eye of a candle lit. Thunderstorms sometimes make my day. Based loosely on a baking book 'Home Baking' by Martha Day given to me as a birthday present by my children. Sift flour into a large bowl. Add yeast and mix. Add the chopped rosemary and sundried tomatoes. Mix. Add salt and add 1 cup of lukewarm water and the rest of the liquid ingredients. Mix with a wooden spoon or on the electric mixer with the paddle attachment. Mix on slow and if necessary add more water. The dough should be soft and slightly sticky. Change the paddle attachment to the hook attachment and mix further OR turn out onto lightly floured board and knead by hand for at least 10 minutes until the dough is smooth and elastic. Flour your hands if the dough gets too sticky. Do not over flour.....it's always better to err on the sticky side. After kneading the dough should be smooth and much less sticky. Shape the dough into a smooth ball and place in a lightly oiled bowl, cover with a damp cloth and allow to rest for an hour or until it doubles in bulk. Test with a poke of your finger and if the depression stays like a belly button without bouncing back its ready for the second kneading. Knead for another 5 minutes and let rise again until double in bulk. When risen shape into an 8 inch flattish round, score the top with a blade and let rise until double in bulk. Bake at 220 C for 10 minutes, take out, lightly dust some flour over and bake for another 20 minutes on 200 C. Take out from oven and test for doneness by tapping the underpart and it should sound hollow. Enjoy.....warm or with a bowl of creamy soup. 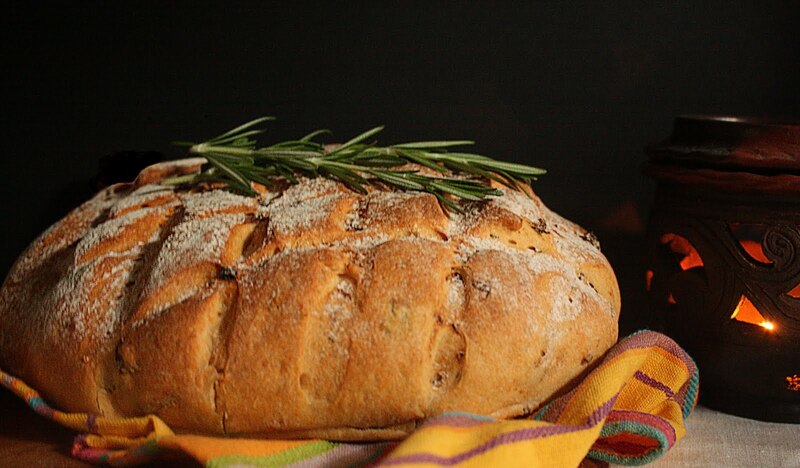 Note : This bread can be made with only one rising. I am submitting this to Yeast Spotting. There's a reason why 'prawn brain' or 'otak udang' (oh-tuck oo-dung) is a Malaysian idiom used to describe an extremely stupid person. It's because prawns pile poop in their heads. And along a little vein on their backs too. So the next time you're cleaning prawns snip the front half of their heads off in addition to removing the little 'vein' along the curve of their backs. 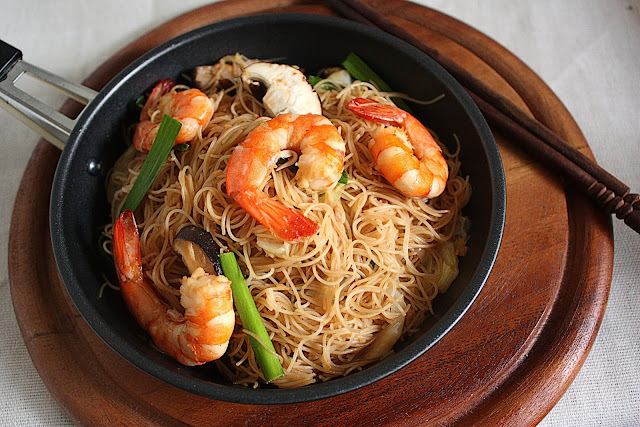 The reason I'm telling you this is because this recipe for fried rice noodles uses a sweet, rich and creamy pink prawn stock made by blending the shells and heads of sauteed prawns to a mush and the juice drained and squeezed out. So it is a pretty good idea to make sure your prawns are poop free. Agree? 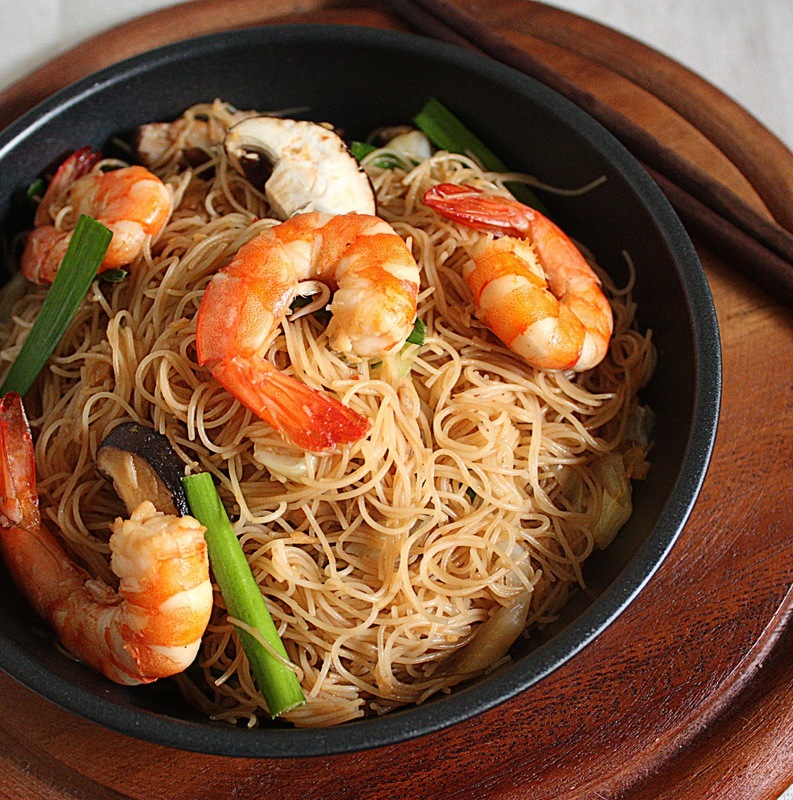 Having said that, can you imagine how delicious this noodle dish is? Prawn/prawn juice is one of the many natural flavour enhancers....it contains umami......the fifth primary taste in addition to sweet, sour, salty and bitter. 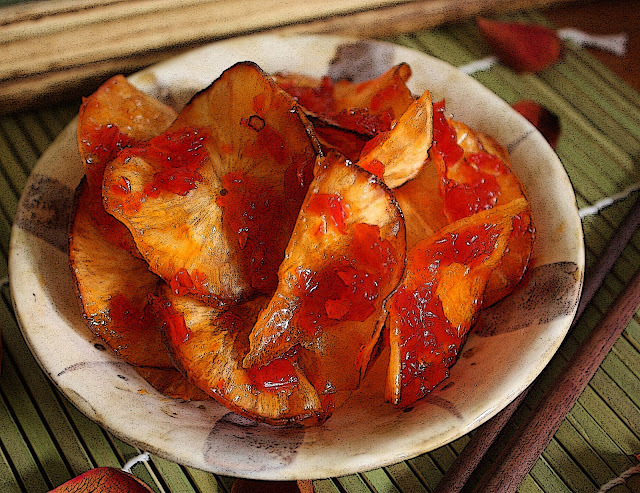 Put simply umami is a pleasant savoury taste imparted by glutamate that makes food taste delicious. Click here if you would like to learn more about umami or if the grey cells are feeling exceptionally frisky today. I love umami but I love not chemistry. Or was that biology? (( boggle )). Anyway what I'm trying to say is .........Stir Fried Rice Noodles is not rocket science. It's not even science...........it is Art. Now to the art. 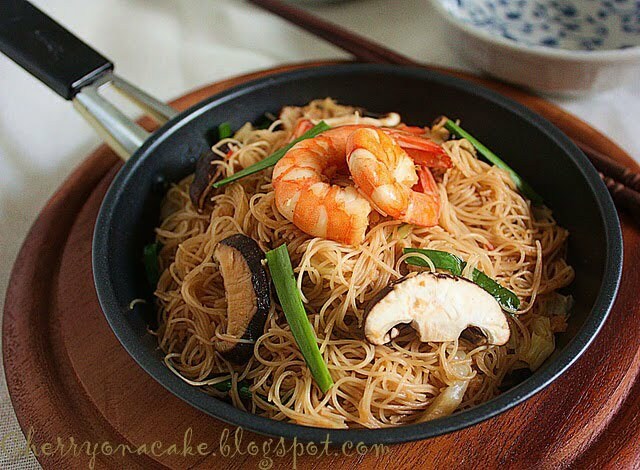 Fried rice noodles is a street food. It's disgustingly cheap and may be stir fried, soup-ed up or sauced up in countless ways. 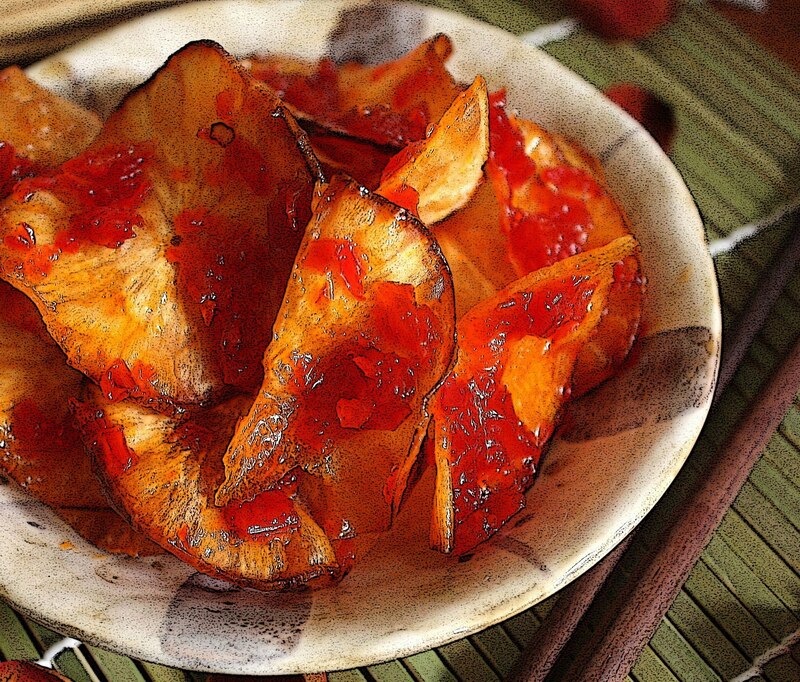 Usually bought in its dried form, it is given a soak for an hour or so to soften up. It's then drained, given a few shakes in a colander and tossed into a sweet, spicy seasoned sauce, bubbling away deliriously in the wok waiting to be puckered up by the noodles. How to clean the prawns. Well. Using a small paring knife, make a little incision between where the head joins the body. You'll be able to see the 'vein' joining up into the head. See how the poop track is connected to their heads? The amount of rice noodles is an estimate. I had forgotten to weigh them in their dried form before soaking. But its was more than enough for 2 persons. About 150 - 180 gm of dried rice vermicelli/skinny rice noodles, soaked in cold water for an hour and drained. Keep aside. Note : The noodles will not go completely soft. But don't worry. It will soften further in the cooking. 6-7 medium sized prawns, cleaned as above leaving the shells and heads intact. Blend or pound the onion, garlic and ginger to a paste. Prepare and clean the vegetables and keep aside. Prepare the prawns as above and season the beef slices. Heat up a wok. Pour in 1 T of the cooking oil. When hot stir fry the prawns for a minute or two, adding salt n pepper to season, until they go completely pink and are cooked. Lift out and keep aside on a plate to cool a while. When cool, peel prawns and place all shell and heads into a small food processor and blitz until very fine. You may add a little water to help it along. Take the mush out and strain, squeezing out the juice into a small bowl. Discard the squeezed ground prawn shells. Keep the juice. Pour the remainder of the oil into the wok and warm it up till fairly hot. Throw in the ground onions, garlic and ginger and chillie paste and stir fry until aromatic and the paste is cooked. About 2-3 minutes. Throw in the seasoned beef, mushrooms, veggies (except chives) and finally the cooked prawns, stirring all the time. Put in the oyster sauce, the 2 soy sauces, salt and pepper to taste, the prawn juice and finally 1 cup of water or chicken/beef stock. Stir. Bring to the boil. 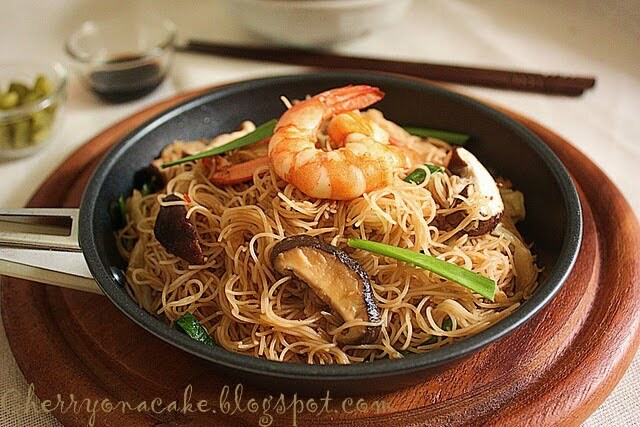 throw in the drained noodles and mix well to ensure the noodles are enveloped by the sauce. Add in the chives at this point and continue to mix well, cutting through the noodles if necessary. 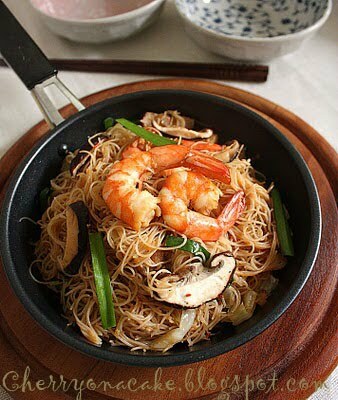 The sauce will be soaked up by the noodles and the noodles will become softer and cooked through as you stir fry. If you find it a little dry add more stock or water. Season with more salt n pepper if necessary. Once everything is well mixed the final dish should be a little moist and not too dry. Serve hot. These cookies made the top 9 on Foodbuzz today, 26th May. Happy Buzz day! I came up with a peanut thumbprint cookie with a nutella centre. Clever me. It was very very delicious. Yup. We're related. Through food. I made some changes though. Instead of using 250 ml of oil I halved the amount and used butter to replace. I also rolled the cookie dough balls in chopped peanuts and then made a thumbprint and after they had baked and cooled down I filled them with nutella. I was so pleased with myself (and the cookies) because I liked the way they looked, the taste and the variety of textures that I could get all in one cookie. *A big pat on my back*. Yes I'm that pleased :))) And it is a fusion of an Asian and a Western cookie. These peanut cookies (Fah Sang Peng) are a popular must-have cookie during Chinese New Year and they have a distinctive Asian flavour because of the use of oil instead of butter. But with the replacement of half the oil with butter they developed a richer flavour. They were delicious as in very delicious. May I also add that my indecisiveness between making a thumbprint cookie and a peanut cookie had led to this. Place butter in the bowl of an electric mixer. Beat until soft and creamy. Add in ground peanuts, castor sugar, flour and mix until evenly combined. The mixture will still be dry and crumbly. Pour in the oil as the mixer runs and stop when the mixture comes together without being too soft and sticky. It should feel comfortable without being crumbly or too soft. Roll in 1 inch balls. I used a melon baller. Roll into a smooth ball and dip in egg white and then in chopped peanuts. Place on a baking tray and make a depression in the centre either with your thumb or the end of the handle of a wooden spoon (I used the broader end of a chopstick). Bake at 170 C for about 10 minutes or until light golden brown. Let cookies cool completely before filling with a swirl of Nutella using a teaspoon and swirling it with the teaspoon just before serving. Or course you can just make them plain without the depression and serve them without Nutella. Just as delicious. I waited a long time for this post. I was excruciatingly eager to get this post up because colors just make my knees go all soft and translucent, like sauteed onions. I think Peace and Light knew that. They knew I would adore these candy coloured sugar cookies. And they were completely right. I do. My sweetie pies. At only 11 and 12 they made these all on their own. 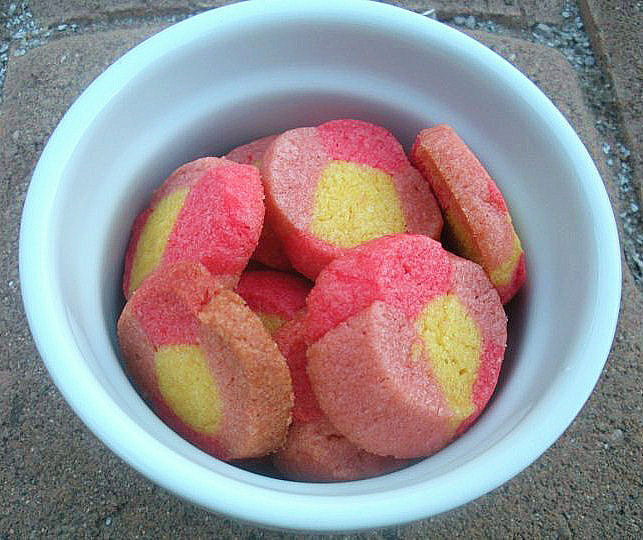 After their brother H had made the brownies, a few posts ago, Peace and Light thought candy coloured cookies would make a cool post too. And the rest they say ........is a baking tray and cookie dough. Peace loves horses, she rides, she cooks, she bakes, she sews, she knits, she crochets (surpassing her Mom..........and me), she decorates cakes but she also has a deep passion for animals. So she might make a great a vet one day or perhaps a great pastry chef.....the way I see it. Light did nanowrimo and completed the challenge of writing 40,000 words in a month and submitting her story. Light is the story teller, the writer, the artist, the dreamer. She is the main creator of Zoe and Bo, their one-day-to-be-very-famous-comic-strip-series she says. Now why do I get the feeling that that might just be true? As if that isn't enough they surprised me by making some animations so that you , dear readers, will know how to put the spiral and flower cookies together. Thank god for grandkids! And in between a million other things their mommy took the cookie photos in their lovely gravel and rock garden just before the sun went down. Aren't they gorgeous? I think she did a great job. 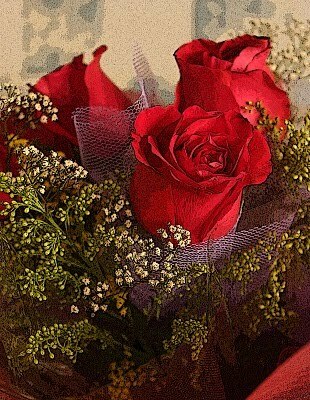 Thank you so much dear. I am Light, and this is my first time making these cookies, and I made them with my sister Peace. 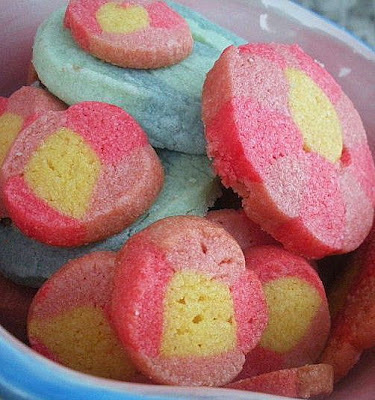 They are sugar cookies, and you get to color the dough. (That might be a messy job.) 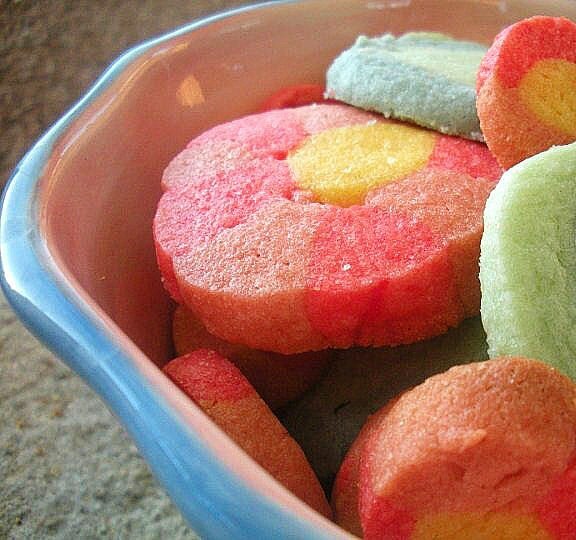 These are cool, chewy cookies, and I hope you will like making them! I've been wanting to make these cookies for a long time, and voila! 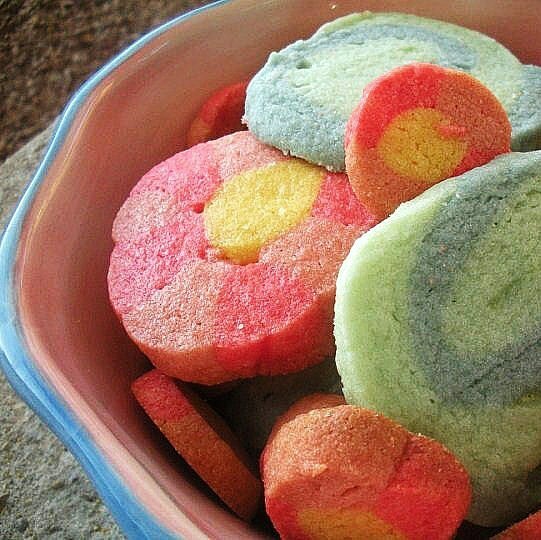 Super, amazing colorful cookies just baked! I got this from a kiddish cookie cookbook, and there are five recipes for these cookies. You can freeze and color the dough one day, and bake the cookies the other day, but you can do it in all one day. This is how you make Spiral and Flower cookies. Crack the egg over a small bowl. Pour in some water and and beat with a fork, and that's it! Preheat the oven to...hmmm...how about 375˚ F? Okay then, hurry up. Okay, next, cream the softened butter and sugar in a mixing bowl. (Use an electric mixer.) Did I say softened butter? Anyway, crack the egg into the butter-and-sugar mixture and blend very well. Then add the dry ingredients to the butter-sugar-egg mixture. Voila! Dough! Amazing! You have made Sugar Cookie dough all by yourself! 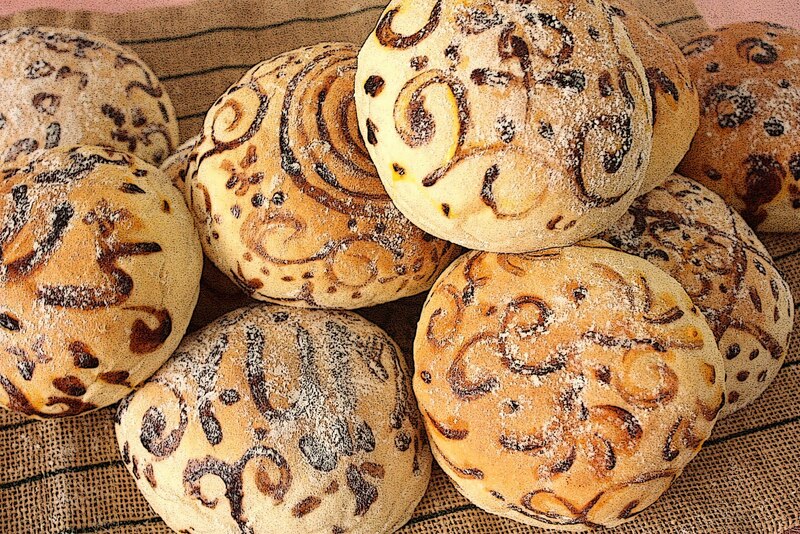 To make the spirals, separate the dough into two blobs (or balls?). Color them and smash them equally into rectangles. Wrap and chill the rectangles for 20 minutes. Drumroll please...Okay! This is the waiting time. Freeze this spiral log for 2 hours. I repeat, 2 hours. Grease the cookie sheets. 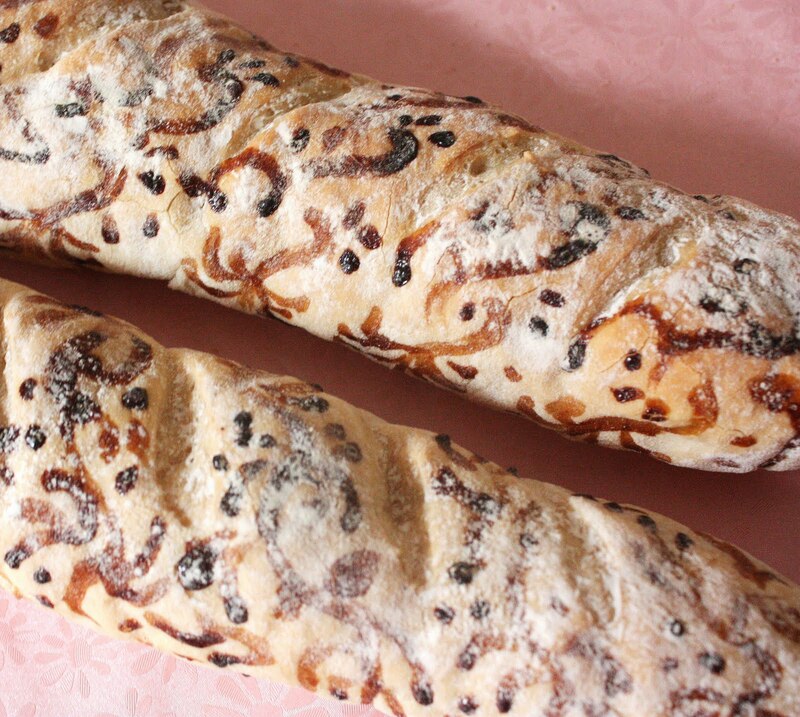 Unwrap the dough log and cut it into cookies about 1 centimeter thick. Put them on the cookie sheet and push it in the oven. Close the door. Well, you have made Spiral cookies! Congratulations! Preheat the oven. Make the dough and Egg Wash. Separate the dough into two big ones and one small. Color and freeze them for 15 min. Roll the two big dough balls into snakes and stick them together with Egg Wash. Use the small blob for another snake and put it in the middle of the whole snake rectangle. Roll this whole thing together to make a log. Wrap it in plastic wrap and freeze it for two hours. Unwrap the log and cut it into cookies. (The flowers I made didn't turn out very well.) Put the cookies on the cookie sheet and put them into the oven. Slam the oven door! Thank you Sweeties ~ I just LOVE the sugar cookies! You know that don't you?. Bite, crunch, chew and yummmmmm. What is large, fat, soft, huggable and can be eaten? A look alike teddy bear with its arms and legs crossed. This Challah turned out so huge that Z was constantly exclaiming as I cajoled it from the oven. This is the hugest braided bread I've made. It sat diagonally on my largest jelly roll tray and it just grew and grew. I created a beast. Then with a brush wielding hand (if you have read my earlier posts you'll know I'm on a bread painting binge) I painted it and I thought it looked all right until I saw the photos. The design was inspired by the two pots of ferns that stand guard on each side of our front door. The longer I stared at the photos the more frightened I became. It looked reptile-ish because of the glaze-y and shiny finish. Oww. It's a Frankenstein. (I told you I preferred rustic). But I'm still posting this because I'm not going to make another one so soon. It's huge! I don't think painted bread look too good glazed. Dusted with flour and rustic is so much better. In my opinion. But as large as it is, it is very tender and soft and delicious. A gentle beast. I was afraid of an egg-y smell and taste because of the number of eggs it used, so I had my apprehensions at first, but this had none of that. This recipe uses 4 eggs ~ 2 whole and 2 yolks. Other recipes that I've looked at use at least 5. 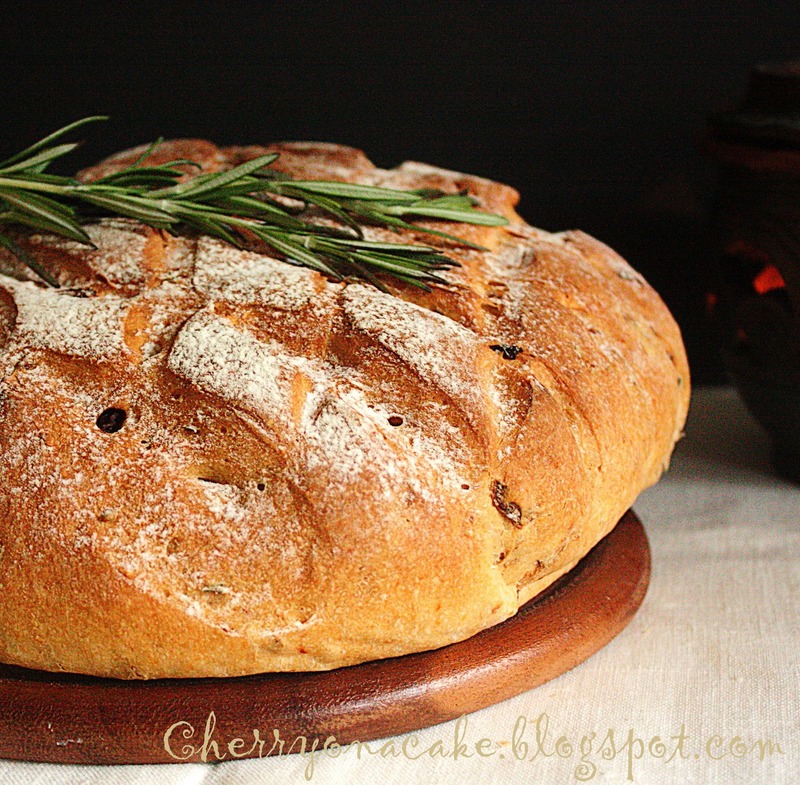 So that was the main reason I went with this one, from Cooking Bread. It turned out perfectly soft and rich and I'm very happy with the results. I totally recommend it. I'm submitting this to Yeast Spotting. In a bowl combine water, eggs, honey and oil. Whisk. Pour the egg oil water mixture into a large bowl and add 2 cups of bread flour, yeast and salt. Beat together. (I used the electric mixer with the paddle beater. Allow to rest 15 minutes uncovered. Then add the rest of the flour 1/2 a cup at a time until finished by which time you would get a sticky, soft dough. I would advise getting a metal scraper to scrape the dough off the board when you want to turn it over to knead. Rather than sprinkling flour onto the dough, flour your hands instead, and that way you will resist adding too much flour. There is no need to knead hard. Just some gentle kneading for 10 minutes continuously will do the job. (If you knead too hard you'll just get all the dough sticking and clinging to your hand). When done kneading place the dough in a lightly oiled bowl cover with a damp cloth and allow to rise until double in size. Once risen, turn the dough out onto a lightly floured surface and divide the dough into 3 equal pieces ( I weighed them so that I got really equal sizes...each were 350 gm). Roll each piece of dough into a long strand about 11 or 12 inches long then braid it. Please look here for braiding. 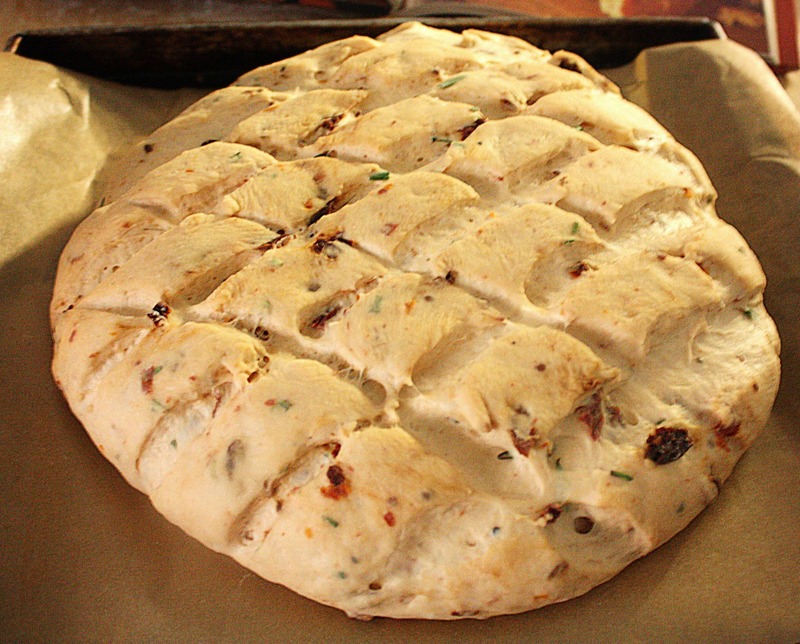 Once braided place on a ready lined baking tray and allow to rise until double in size. Brush with the left over egg whites twice to ensure a shiny finish. I understand Challahs are suppose to be shiny. 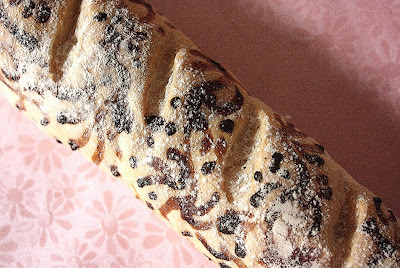 Sprinkle with poppy seeds or other seeds that you like. 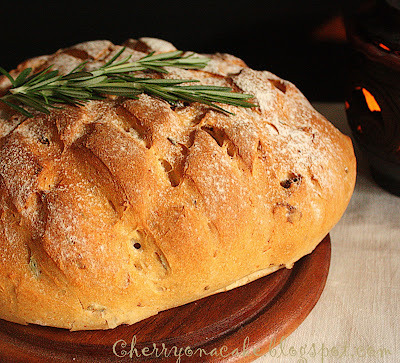 Bake for 20 minutes then rotate the bread and bake for another 15-20 minutes. Note : 3 risings (the 3rd being a very slow rise in the refrigerator if possible) would bring out a better, more flavourful bread. I painted it so I baked it until lightly golden without the egg wash, took it out, painted it and returned it to oven for about 3 minutes to allow the paint to dry and then took it out again to glaze it with egg wash and then baked it again for the rest of the suggested time. Paint : I used egg yolk mixed with a very small amount of thick black coffee. This post was in the Top 9 of Foodbuzz on May 11th 2010. Happy Buzz Day! Be warned of future and probably successive posts of wildly painted bread in all flavours, shapes and sizes. I'm on an unrestrained bread painting binge. 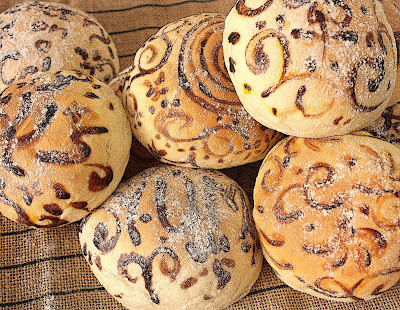 But painting aside, these are truly one of the best ever sandwich buns. They have been circulating several blogs and have been raved over each time. I had to make them and true enough they are so so so good. Soft, substantial and full of flavour. 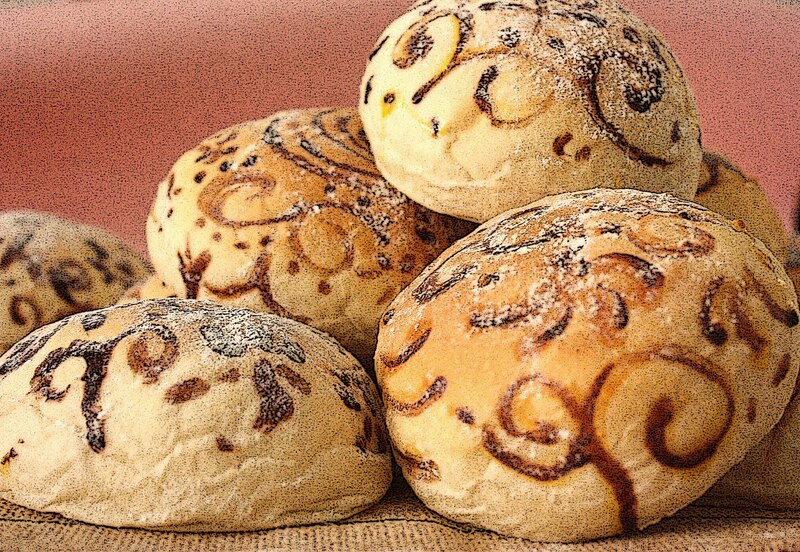 Perfect burger buns that excel shop bought ones by light years. 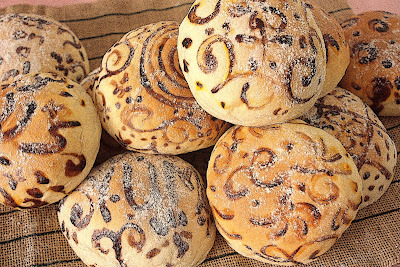 These homemade highly recommended buns have been featured on Cathy's Wives With Knives, Mari's Once Upon a Plate, Linda's How to Cook a Wolf and Lori's All That Splatters. And probably many more! Needing to be kneaded (yea I know.....don't we all feel that way) only once, left to rise and then baked, it's easy and quick to make as well. Maybe I've gone a little overboard with the painting but if it adds a little personality to your plain old boring sandwich...why not I say. A little personality never did anyone any harm. And that goes for bread too. Pour milk, water, butter and honey into a small pan and warm it up. Let cool to 120 degrees and carefully beat in the egg. Mix 2 cups flour with the yeast and salt. Pour in the milk water mixture. Mix until a sticky mass then add in remaining flour 1/2 cup at a time and mix well after each addition using a wooden spoon of spatula. When it forms a stiff dough remove from bowl onto a table top and knead till smooth and elastic (about 5 minutes). I did 10 because I like kneading. Divide into 12-16 portions. (I made 11 portions of 100 gm each). Shape each portion into smooth round balls and place on a baking tray lined with parchment paper. Flatten the top of the round with a gentle pat of your hand. Do the same for all the rest of the portions and then cover with a clean tea towel and let rise until double in size. If you're not painting them you may brush the tops with a beaten egg, sprinkle sesame seeds, coarse sea salt, poppy seeds, pumpkin seeds etc over the top and bake in a preheated oven at 400 F for 10-12 minutes. The top should be a lovely glaze-y golden brown. 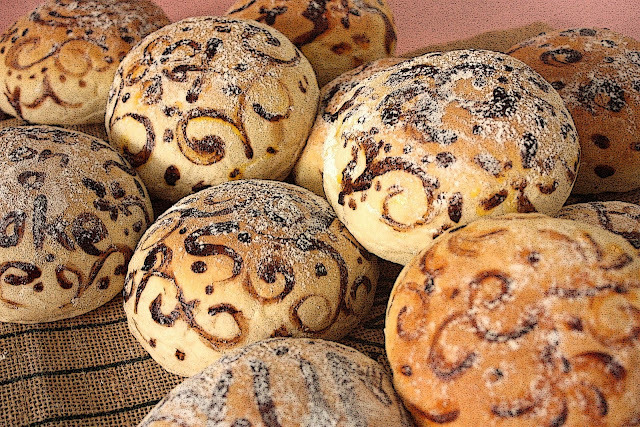 If you're painting the bread, bake the buns plain halfway through until a pale hue of gold appears, take it out and paint designs on each bun. This time I used 1 - 2 teaspoons of cocoa powder mixed with a little hot water to a smooth paste and them mixed it well with half of an egg yolk. Use enough to achieve the shade you prefer. I think it actually worked better than coffee because what I achieved as a medium was a nice smooth paste-y 'paint' that didn't run as easily as a mix of coffee and egg yolk. The colour was good too and Z did not complain of the coffee flavour that he did not like. I left the other half of the egg yolk plain and used that as a yellow shade. It doesn't show in the photo but I will make it again in another post to show it more clearly. I removed one bun at a time from the tray with a spatula very gently because this is a soft bun and I didn't want to dent it. Then I painted on the design, dusted with a little flour and baked them again until a golden brown. 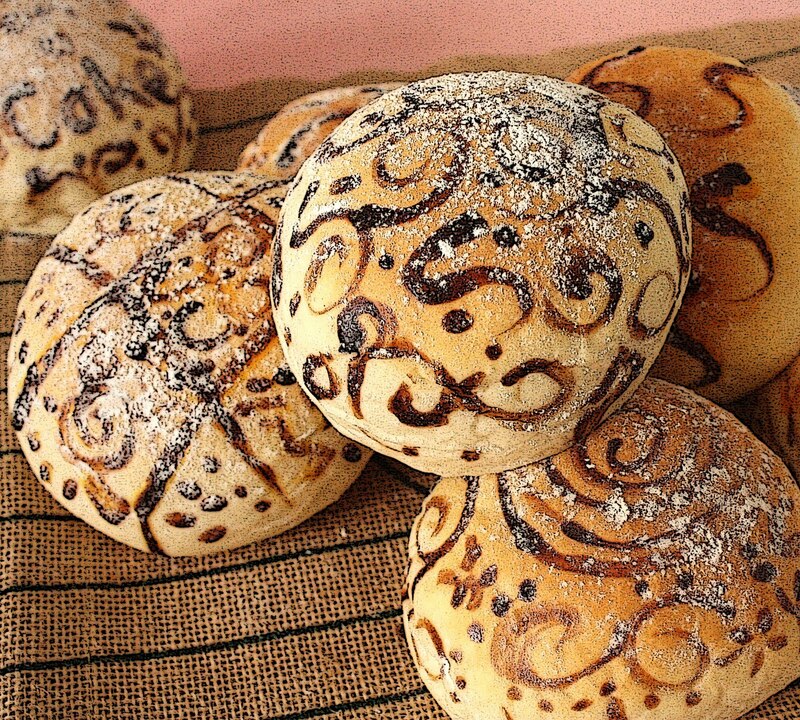 You could also glaze the buns after painting them and then finish baking until a golden brown. What you will get is a glazed patterned bun. I have yet to try that. But I would probably prefer rustic. As Jamie Oliver would say. ...Bob's your uncle! Happy days!...aaand...Ba dum! I never did enjoy watching tatoo reality shows on tv because I never could understand the joys of tatooing. But now I know. Painting on an object is quite different from the painting of an object. Putting in all those intricate details on skin is very much like putting in all those intricate details on crust. Like graffiti on walls. Minus the pain of your subject. And minus the authorities. But total satisfaction. So I decided to make baguettes as a canvas. For 2 reasons. I was intrigued by the way they were shaped and to feed my family. The recipe for the baguettes comes from a blog of a young chef in training, Dylan, on his blog, From Cook to Chef. The post came with a wonderful you tube video which I have downloaded as well. 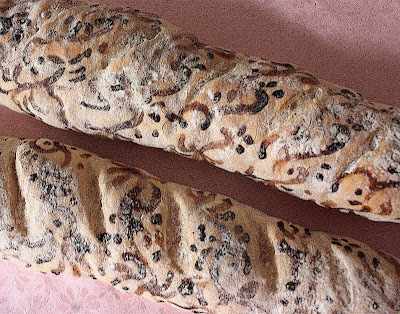 It is not simply the rolling and rolling that gives the baguettes their perfectly cylindrical shape but the building up of a 'backbone', sealing it, flapping the dough and repeating the process at least 3 times before finally rolling the dough into the cylindrical shape that you see above. And below. 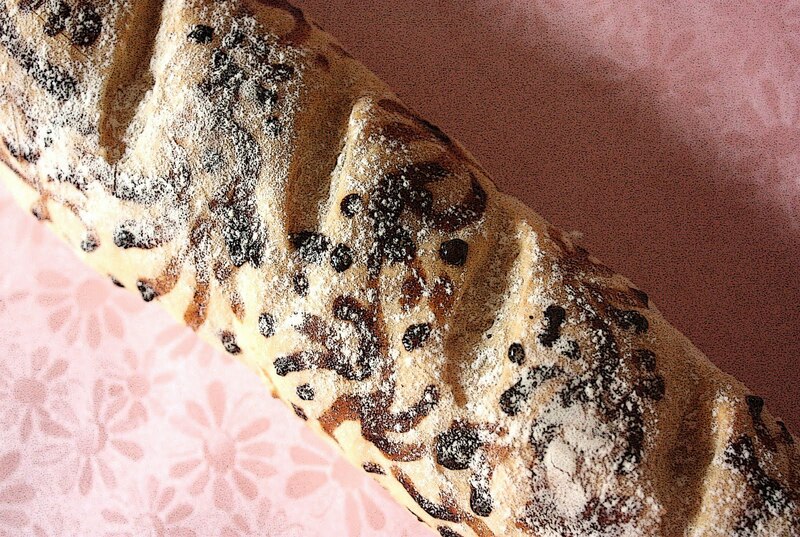 I first saw painted bread on Monique's blog...La Table De Nana. A blog by a very artistic and nice woman. 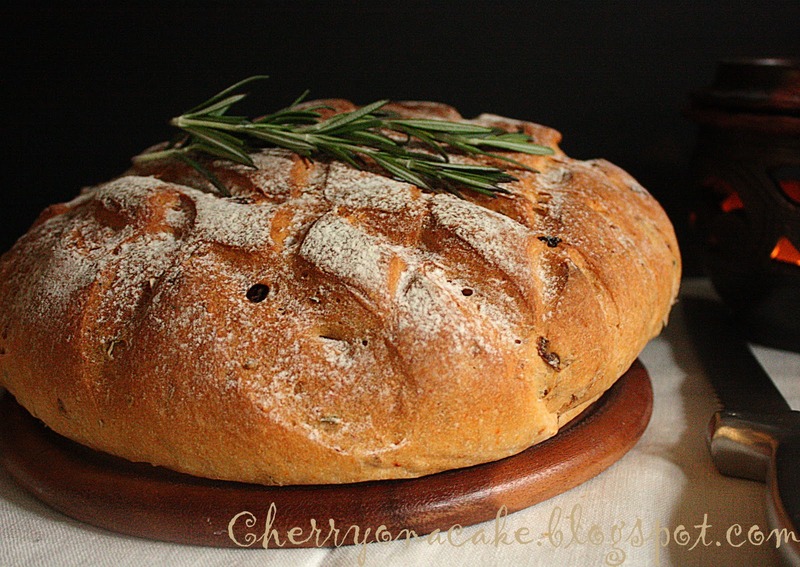 But that was so long ago that I had forgotten all about it until I saw it again on Chef Tess Bakeresse blog. My mouse finger grew as stiff as a baguette. I couldn't get it to unclick for a long long time. They were absolutely lovely. The painted bread I mean. So I dove in. The 'paint' is simply egg yolk and coffee combined. I love the colour it makes. It reminds me of henna. Dust it with a little flour and you get rustic. You can brighten it up with more colours, particularly red and green, either by using food colouring or natural colours from herbs or fruit. I have yet to go thus far. But go I will. My heart's a-thumping and my fingers' a-dancing. Nothing's stopping me now. Burger buns here I come! Some doodling I did while waiting for the chicken to stew. On kitchen paper. Most of the designs I did were very basic S's, squiggles and curlicues that almost anyone can do. Just be brave and paint. If you don't like what you paint feel free to eat it up and put an end to it's existence. Mix the dry ingredients together then add the water and bring mixture together. Knead for 10 minutes until smooth and elastic. Don't take any shortcuts says the young chef because it will affect the finished texture of the bread. Let rise in a lightly oiled bowl until double in size or you can make a belly buton and it stays. On how to shape the baguette please watch the video. It's really quite simple to do and I know you will be successful. 1 or 2 teaspoons instant coffee granules mixed with very little hot water to dissolve. When the coffee has cooled mix it with the egg yolk until you get the desired darkness that you prefer. You don't really need the whole amount of egg yolk. Half the amount would be sufficient to paint all 3 baguettes from this recipe. Bake the baguettes plain (WITHOUT an egg wash or any sprinkles on top) until only half way done that is until very lightly golden. Take it out of the oven. Paint on any pattern you like then pop it into the oven again and bake until golden brown. In didn't time my baking but please refer here for baking time.